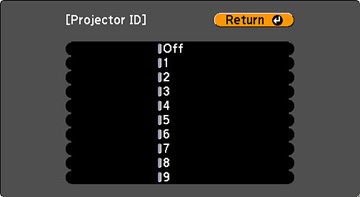 If you want to control multiple projectors from a remote control, give each projector a unique ID. Select Projector ID and press Enter ( ). Press the arrow buttons on the remote control to select the identification number you want to use for the projector. Then press Enter ( ). Repeat these steps for all the other projectors you want to operate from one remote control. Note: If you don't know the projector's ID, aim the remote control at the projector and press the ID button to temporarily display the projector's ID on the screen.